Did you know there is a difference between tasting your bourbon and drinking it? The correct way to drink bourbon is however you like to drink it; mixed or on the rocks on a hot summer day, straight up next to the fire in the dead of winter, or with a twist of lemon with dinner. It’s all good. But that’s very different from tasting bourbon. Tasting bourbon is a careful examination of the bourbon’s nuances and aromas without the hindrance of a mixer, or an abundance of ice or water that will ultimately dull the flavors. Tasting bourbon may seem complicated. It may, at first, seem like people must have incredibly delicate palates to taste so many flavors in a bourbon when many people just taste, well, bourbon. But it isn’t difficult. Appearance: Is it clear? Cloudy? Light amber or dark mahogany in color? Age, proof, and filtration methods all affect appearance. 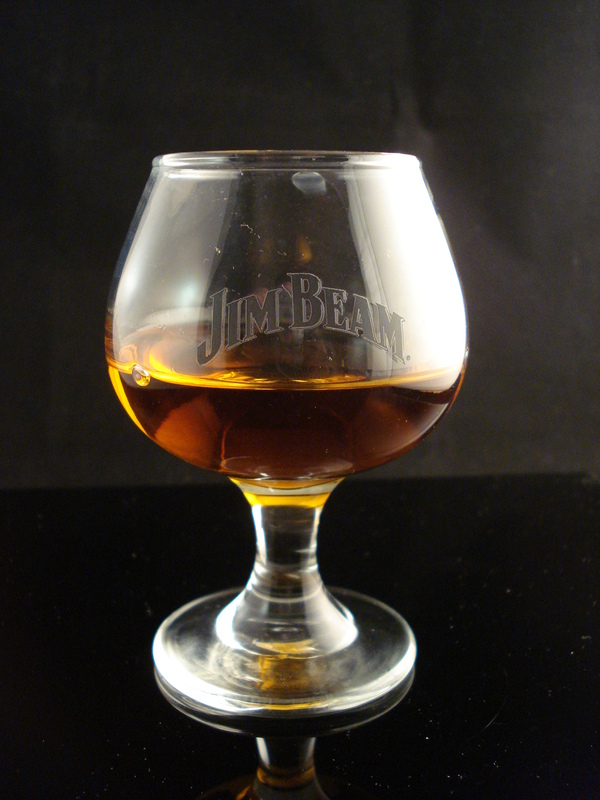 Hold the glass up to the light, or in front of a clean white sheet of paper to get a good look at it. Swirl it around the glass once or twice. Aroma: Smell is a vital part of taste, and thus it’s very important to not skip the aroma portion of a taste. Keeping your lips parted, stick your nose right above the opening of your glass, even in the glass if you’re using a snifter or Glencairn. Taste: Don’t gulp the bourbon. No matter how strong it is, you’ll get used to the alcohol burn on the tongue until it doesn’t bother you. So take a generous mouthful into your mouth and “chew” it. The folks at Jim beam call it the “Kentucky Chew.” Move the bourbon around inside your mouth with a chewing motion to coat your tongue. Notice the difference in flavors from the front to the back of your tongue. Finally, swallow it. The tongue has several tasting “zones.” The tip of the tongue detects sweetness. The middle of the tongue detects salty flavors, and the back of the tongue can taste bitterness. These zones, combined with the aroma, define the flavors of the bourbon. Once you’ve done that, you may find it helpful to add a few drops of distilled water to the bourbon. Don’t over-water it! You can always add more water to the glass, but you can’t un-mix it once you’ve poured it. Adding distilled water can help open up the aromas and flavors of the bourbon as well as bring the proof down slightly if it’s a high proof spirit. And why distilled? Simple. Iron is the mortal enemy of whiskey, ruining the taste. That’s why bourbon is mostly made in Kentucky- the entire central portion of the state sits on a limestone shelf. The limestone naturally filters iron out of the streams and creeks. Distilled water is free of iron. So you’re ready to taste? First things first, you need a good glass. Rocks glasses are great for drinking bourbon, but bad for tasting it. The open mouth of the rocks glass fails to trap any aromas and makes it difficult to get a good whiff of the spirit. Opt instead of some sort of tasting glass. 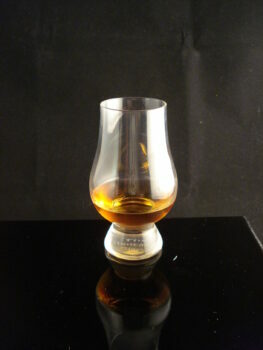 The most popular these days is the Glencairn glass, as you may have seen in many of our review photos. The small base makes a handy grip to hold the glass at various angles to really make it easy to get a good look at the appearance. The bulbous glass makes it easy to get a good swirl or two, and the narrow neck with flared rim allow the aromas to gather just under the edge and the alcohol smell to dissipate. Overall, it’s perfect for tasting. You can also use a whiskey snifter. Similar to the Glencairn without the flared rim, they make great tasting glasses. You can get them in a variety of sizes. Lastly, you can use a small white wine glass. Be careful of red wine glasses, as they can be too large to concentrate the aromas. Distillers use a glass very similar to a white wine glass called a Copita to test their product before bottling. They are available from various retailers. Then, grab yourself a bottle of distilled water from your local grocery, and a spoon or eyedropper to add water to your bourbon if that’s your choice, and have at it! 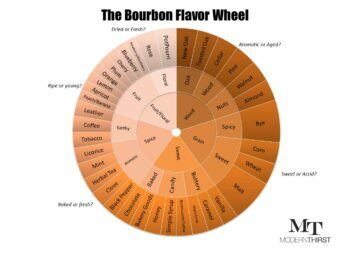 If you find yourself struggling to identify flavors and aromas, tasting wheels are a great tool to keep on hand. There are countless ones available on the internet, but we’ve put one together for you. Feel free to download it and use it as often as you like. Start from the inside of the wheel and work your way outwards. We’ve included a few primer questions around the outside to keep you delving further into the flavors. And don’t limit yourself to the flavors on this wheel. If you taste something that isn’t listed, just add it yourself, or make mental note of it. This is just a guide! I’d also recommend that you don’t sit down to taste a bourbon with someone else’s review in front of you. Don’t let their tastings color your initial impressions. Drink it yourself on its own merits first. If after a few sips you want to compare your notes to, say, ours at Modern Thirst, then bring out our reviews and see if you identified some of the same flavors and smells, or if you can go back and identify them later. Last, GO TASTE SOME BOURBON! The best way to become proficient at bourbon tasting is to do it! It’s always easier to taste it in the comfort of your own home, or a friend’s, but there’s no reason you can’t do it at a bar or restaurant as well. It’s more cost effective to split a bottle or buy one glass at a bar than to buy a full bottle of a rare limited release bourbon just for one taste. Once you’ve started, please send us your own reviews and thoughts. 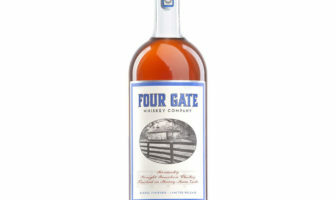 Check out all of our our bourbon reviews here, and post your comments, or email your thoughts to Bill@ModernThirst.com. I’m sure our readers would appreciate as many view points as possible! 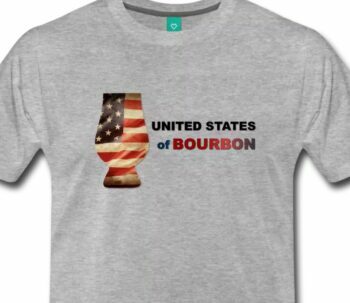 Good straightforward info here for the new to bourbon drinker. Thanks for the insight and flavor wheel, might need to laminate a couple. Thank you, Bill! Excellent information and superbly written. I’ve been drinking bourbon for several years but never researched the spirit until this year, when I started working as a tour guide for a local craft distillery. Your information will be passed on as I conduct my tastings. I’ll include your website for more information.